This enumeration specifies whether the check boxes or radio buttons will be rendered in a table (Table), inline (Flow), in a <ul> element (UnorderedList), or in a <ol> elment (OrderedList). This specifies whether the list of controls will be rendered horizontally or vertically. RepeatColumns This sets the number of columns, in case RepeatLayout is set to Table. If RepeatLayout is set to Table, then these properties configure the spacing and alignment of the cells of the layout table. 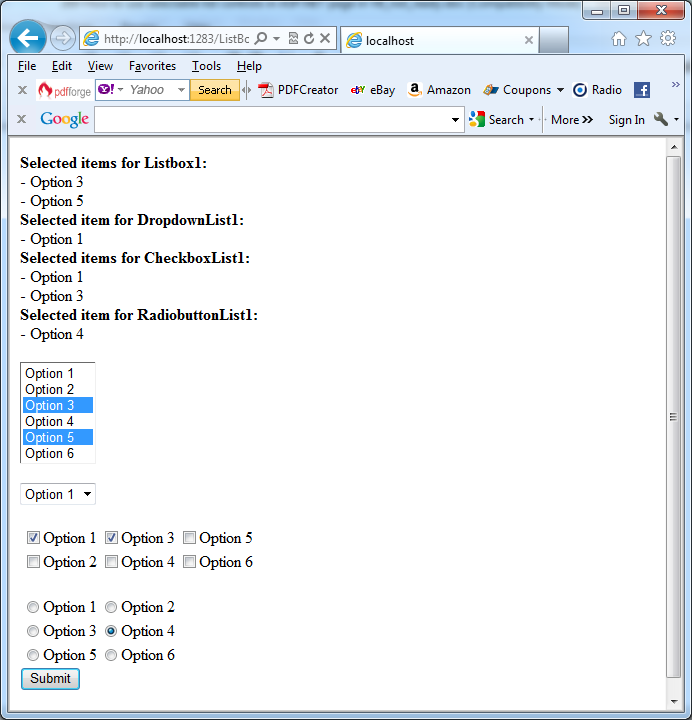 – For the DropDownList and RadioButtonList controls, you can use the SelectedItem property. – For the other controls that allow multiple selections, you have to cycle through all the items in the Items collection and check whether the ListItem.Selected property is true.